After an email to the council on Thursday evening and with the rubbish still out on Saturday, I decided en route to the High Street I would take photographic evidence of the fly-tipping problem I’ve got not only in my ward, but metres from my house. For over 10 weeks now we’ve been using wheelie bins in Park Ward, as the majority of the house have small alleyways we have two 120 litre bins. A brown one for recycling which is collected every other week (and if that’s full you can leave more to the side if it’s clearly recyclable waste) and a black one for landfill waste which is collected every week, but no side waste. 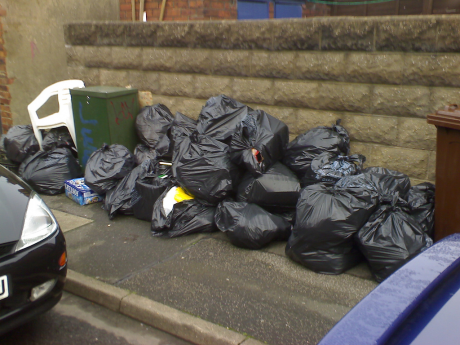 This includes black bags which are no longer collected, however it seems that some households in Park Ward just don’t care and continue to dump and allow others to dump black bags outside their houses.